After impressing at The World Games in Wroclaw, where she won 3 medals (2 golds and one silver), 15 years old russian rising star Ekaterina Mihaylushkina emerged as absolutely dominant figure at the Finswimming World Junior Championships in Tomsk (Russia), winning 3 individual golds, another one and one silver with the relays. Representing at the same time the present and the future of the Finswimming at international level. Also impressing CMAS’ President Anna Arzhanova, attending the event in Tomsk. WOMEN – Mikhaylushkina won gold on 100 metres, 200 surface and 50 surface women, respectively in in 38″79 (just 0″39 shy from his own world junior record), in 1’30″12 and in 17″89 (0″36 shy from record). Double silver for ukrainian Yelyzaveta Vakareva (40″96 on 100 and 1’31″20 on 200), with french Margot Le Flem bronze on 100 in 41″49 and german Johanna Schikora bronze on 200 in 1’31″95, korean Min Jeong Kim silver on 50 in 18″39 and russian Margarita Russo bronze in 18″47. On 100 bifins and 50 bifins double gold for hungarian Anita Szabo (49″02 and 22″28). On 100 her fellow countrywoman Dorothy Hamlin was silver in 49″03, french Joana Desbordes bronze in 49″13, on 50 russian Valeriia Andreeva silver in 22″20, italian Viola Magoga bronze in 22″64. 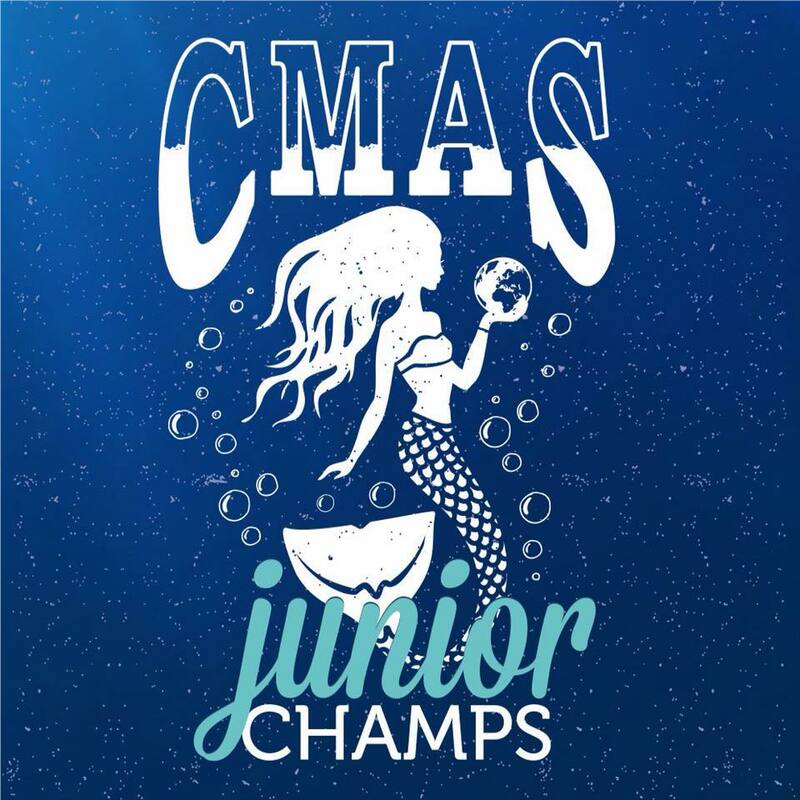 Hamlin the won 2 golds: on 400 bifins in 3’49″22 (greek Evdoxia Thomakous was silver in 3’51″11 and french Joana Desbordes bronze in 3’51″60) and on 200 bifins in 1’46″81 (Csenge Stadler silver in 1’47″06, french Joana Desbordes bronze in 1’48″27). On 400 surface russian Elena Lopatina was gold in 3’18″73, turkish Ceren Yesilbas silver in 3’19″00, german Johanna Schikora bronze in 3’20″27. Double gold for russian Viktoria Partsakhashvili on 100 e 400 immersion (37″93 and 3’03″52). On 100 korean Kyeong Seon Kim silver in 39″37, poland Zuzanna Rzepka bronze in 39″60, on 400 greek Eleftheria Arkoudi silver in 3’15″99, russian Valeriia Kuznetsova bronze in 3’16″69.Turkish Ceren Yesilbas won gold on 1.500 surface in 13’46″09, german Nele Rudolf was silver in 13’52″93, russian Ekaterina Zanoskina bronze in 13’56″85. MEN – On the men field, 4 athletes emerged winning 2 individual golds each. Czech Jakub Kovarik won 100 surface in 36″68 (korean Gun Young Han silver in 36″81, russian Andrey Avdushkin bronze in 37″22) and 100 immersion in 33″97 (korean Bo Seong Jang silver in 35″05, ukrainian Vitalii Sushchenko bronze in 35″57). Double double for Russia in 100 bifins and 50 bifins and double gold for Aleksey Fedkin (43″02 and 19″46). On 100 silver for Daniil Kolosov in 43″66, on 50 for Evgeniy Shishov in 19″97. Bronze for poland Marcin Lukowicz on 100 in 43″66 and for czech Jakub Klimpar on 50 in 20″30. Two golds even for hungarian Alez Mozsar, on 400 surface (3’02″37) and 400 immersion (2’54″85). Ukrainian Oleksii Zakharov was silver on 400 surface in 3’02″63 and russian Alexandr Khudyshkin bronze in 3’09″02, ukrainian Vitalii Sushchenko silver on 400 immersion in 2’59″76 and russian Alexandr Khudyskhin bronze in 3’00″17. Another double gold on 200 bifins and 400 bifins for greek Konstantonos Livogiannis (1’38″54 and 3’33″69). Russians Aleksey Fedkin was silver on 200 in 1’38″86 and Daniil Kolosov bronze in 1’39″66, hungarian Bence Stadler was silver on 400 in 3’38″33 and russian Aleksei Lobachev bronze in 3’39″17. Ukrainian Oleksii Zakharov won gold on 1.500 sirface in 12’41″38, turkish Muhammed Emin Bay silver in 12’47″92, russian Nikita Borodin bronze in 12’57″96. On 200 surface double for Russia with Egor Kachmashev gold in 1’24″50 and Andrey Avdushkin silver in 1’24″96, korean Jae Baek Jeong bronze in 1’27″37. Korean Gun Young Han won gold on 50 surface in 16″30, russian Kiriil Vasiliev silver in 16″38, korean Jae Uk Song bronze in 16″60. RELAYS – Russia dominates the 4 events relays program, winng 3 golds and one silver. Russia won 4X100 bifins in 3’06″82 (Aleksey Dedkin, Valeriia Andreeva, Iana Martynova, Daniil Kolosov), with Hungary silver in 3’07″83 (Marcell Kocsis, Andras Fazekas, Anita Szabo, Dorothy Hamlin) and Czech Republic bronze in 3’11″49 (Jakub Kovarik, Tereza Chromcova, Daniela Uhlirova, Jakub Klimpar); the 4X200 surface women in 6’09″92 (Elena Lopatina, Iuliia Bryndina, Anna Artamonova, Ekaterina Mikhailushkina), with Ukraine silver in 6’14″70 (Daria Karuk, Kateryna Kukhar, Valentyna Rieznik, Yelyzaveta Vakareva), and Germany bronze in 6’19″16 (Michele Ruetze, Nele Rudolf, Anne Eisenberg, Johanna Schikora), the 4X200 surface men in 5’42″66 (Egor Borodulin, Danil Gusev, Andrey Avdushkin, Egor Kachmashev), with Ukraine silver in 5’52″70 (Serhii Smishchenko, Volodymyr Sushchenko, Borys Tkalenko, Oleksii Zakharov) and Greece bronze in 5’53″63 (Nikolaos Papatheodorou, Vasileios Kolipetris, Konstantinos Terzanidis, Konstantinos Tsiavos). On 4X50 surface mixed South Korea won gold in 1’08″11 (Gun Young Han, Jae Uk Song, Min Jeong Kim, Ui Jin Seo), Russia was silver in 1’08″17 (Kirill Vasiliev, Margarita Russo, Ekaterina Mikhailushkina, Andrey Avdushkin), Colombia bronze in 1’09″61 (Andres Felipe Torres Molano, Maria Camila Joya Aguirre, Merces Malambo Ruiz, Santiago Nicolas Bernal Hernandez). 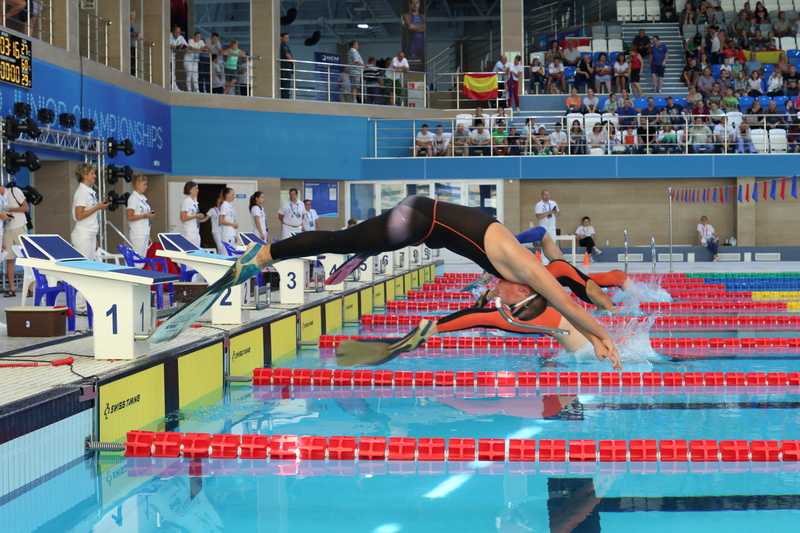 Eleven days after Finswimming showed its great olympic potential at The World Games in Wroclaw (Poland), the CMAS’ underwater sport discipline comes back in the lanes and turns spotlights on its own future, with the World Junior Championships, held in Tomsk (Russia) from 2 to 5 of August. Involving 26 federations and 231 athletes, World Junior Championhisps represent a key time to understand wich direction Finswimming can take in the next years. STARS – From Wroclaw to Tomsk, the athlete who, over all, will link the two events will be 15 years old russian Ekaterina Mikhaylushkina: at the World Games she won one individual gold (100 surface) and one silver (200 surface), adding the gold won with the 4×100 relay. In Tomsk she will compete in the first event of the Championshisp, the 100 surface, where she claims the junior world record (38″55) and the best entering time (38″70 in season). Mikhaylushkina who claims best season time even on 200 surface in 1’28″97, even if she swam faster at the European Senior Championships in Wroclaw, gaining silver medal and setting world junior record in 1’26″39, in the 50 surface (17″58) and in 50 apnea (16″82). Second best entry time in 100 and 200 is for 15 years old ukrainian Yelyzaveta Vakareva (40″32 e 1’30″68). Fighting for gold on 200 surface also the german Johanna Shikora, who swam this season in 1’30″80. FIRST DAY – In 100 surface men only two athletes can boast times under 37″: 16 years old italian Guglielmo Alicicco (36″77) and 15 years old russian Andrey Avdushkin (36″94). In 100 bi-fins women there are 5 athletes who came with credentials for gold: hungarians Dorothy Hamlin and Anita Szabo (both with 49″63), italian Viola Magoga (49″70), russian Valeriia Andreeva (49″72) and estonian Svetlana Silitsenko (49″90). On 100 bifins men the only one under 44″ is the 17 years old russian Daniil Kolosov (43″89), with his 15 years fellow countryman Aleksey Fedkin with 44″18. In 400 surface women no one can come near the 3’17″50 of 15 years old Schikora (who setted the world junior record last 4 July at the European Senior Championships in 3’17″47, only 0″4 shy from bronze medal), with greek Eleftheria Dionysia Poulopouloua with 3’22″35. The same happens on 400 men, with 16 years old ukrainian Oleksii Zakharov who can claim a 3’00″63 that only hungarian Alex Mozsar can bring near (3’06″90). FIGHT – The second day of the Championships will open with 100 immersion women and with two russians with the best entry times: 17 years old Viktoria Partakhashvili (38″88) and 15 years old Sofia Strelets (39″46). In the 100 immersion men there are 5 athletes under the wall of 36″: ukrainian Andrii Poltavets (35″45), czech Jakub Kovarik (35″46), the other ukrainian Vitalii Sushchenko (35″68), russian Alexandr Khudyshkin (35″84) and italian Alicicco (35″98). On 1500 surface women there are two athletes with quite same time: 16 years old turkish Ak Zynep (14’32″35) and 15 years old tunisian Hiba Mahdaoui (14’32″85). On 1500 men is the chinese taipei Po-Han Chen who claims the best entry time in 13’23″00, with german Duncan Gaida secondo in 13’24″30. Two hungarians claim the best times in 200 bifins women: Dorothy Hamlin (1’49″00) and Csenge Stadler (1’49″20). And two russians claims the best times on 200 bi-fins men: Daniil Kolosov (1’39″21) and Aleksey Fedkin (1’39″99). With the time of 1’25” there are 5 athletes with the best entries in 200 surface men: russians Egor Kachmashev and Avdushkin, italians Alicicco and Tommaso Cresci, greek Vasileios Kolipetris. Alicicco who is the faster this season even on 50 surface in 16″35, with south korean Jae Uk Song second in 16″55. Very close times on 50 bi-fins women: season best is for hungarian Anita Szabo (22″36), followed by russian Valeriia Andreeva and italian Magoga (22″88 for both), estonian Silitsenko (22″89) and south korean Min Jeong Kim (22″96). Only two men swam under the 20″ wall in 50 bifins: poland Marcin Lukowicz (19″84) and kazach Yegor Makeshin (19″89). Best time in 400 immersion women is for spanish Elba Cantero Zapata (3’31″76), in 400 immersion men is for french Zugmeyer Colas (3’10″18). Turkish Nazil Su Duru claims best time in new discipline of 400 metres bi-fins (4’06″32), with south korean Min Seo Ryu and ukrainian Anna Kozyr quite far respectively in 4’09″38 and 4’09″40. It happens not the same in 400 bifins men, with 4 athlets on 3”51″: spanish Fernando Garrote Escalante (3’51″30), french Lacan Guillaume (3’51″46), turkish Yigit Kaan Kustemir (3’51″58) and kazach Ratibor Chsherbakov (3’51″82). LAST DAY – The last day of the Championships will open with the the two 50 apena: in men field, south koreans Gun Young Han and Bo Seong Jang lead the entry times with the same 14″97. Hungarian Lili Hajnacs and Konstantina Dionysopoulou leads the field in 800 surface women (respectively 7’23″30 and 7’23″64), south korean Seong Hyun Jun leads the 800 surface men in 6’53″69, followed by ukrainian Borys Tkalenko (6’54″91) and italian Pietro Alfì (6’58″82). Every day of the World Junior Championships will close with the relays: 4×100 bifins mixed, 4×50 surface mixed, 4×200 surface women and men, 4×100 surface women and man the last day. Tomsk (Russia) proudly presents you its next big event!